I traveled alone eastward on Monday, June 11 through Thursday June 14, 2018 looking for mountaintops through southern Idaho with stops in DN22-23, DN32-33, and DN42-43. 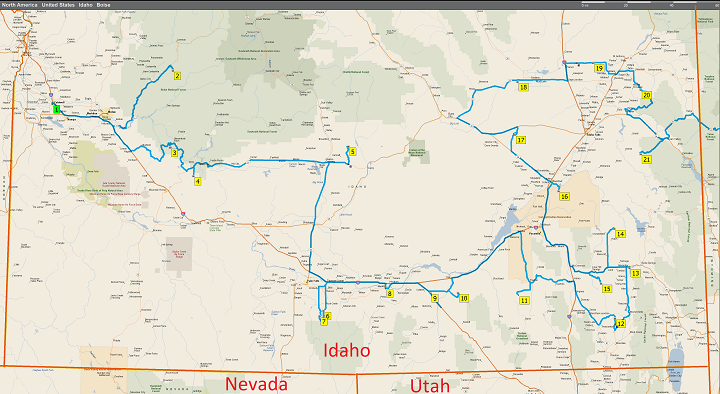 This is a tentative route for scouting through DN22-23, DN32-33 and DN42-43. Once a viable site is found in each grid, I'll setup the 6m station. I hope to activate 2 grids/day with the full station setup. Scouting as I go, then about 2 hours on the air at each grid square. Disable NA VHF Contest. This is most common usage. APRS: Follow me aprs.fi/k7bwh in real time to track my position.